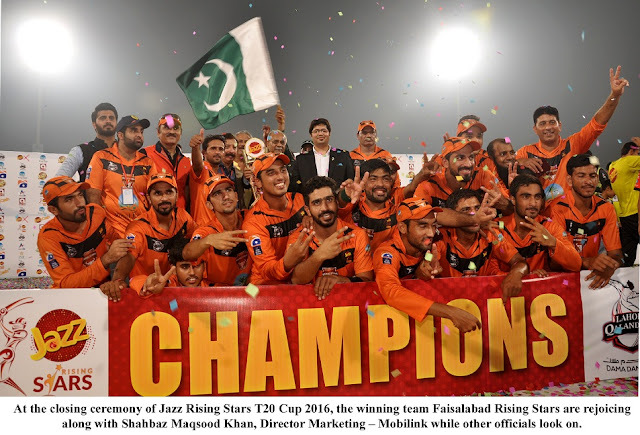 Jazz Rising Stars T20 Cup, organized in partnership with Lahore Qalandars, recently concluded with Faisalabad Rising Stars coming out on top. The tournament saw a total of eight teams participating divided into two groups. Each group comprised of four teams with 16 players each, where the top team from each group battled it out in the final. The final was played between Lahore Rising Stars (LRS) and Faisalabad Rising Stars (FRS). Batting first, LRS could only manage a total of 44 in 11.5 overs. In reply, FRS managed to achieve the target in 7.3 overs with the loss of just a single wicket. FRS were then handed over the trophy by Pakistan Cricket Board executive committee’s chairman Najam Sethi, and Shahbaz Maqsood Khan along with prize money worth PKR 200,000/- ; LRS walked away with PKR 100,000/-. LRS’ Usman Qadir and FRS’ Saad Ullah won the best bowler and batsman award, respectively, with a cash prize of PKR 50,000/- each. To ensure the young cricketers get the desired support throughout the tournament, entry to all the matches at Qaddafi Stadium was free of cost, while a cash prizes of PKR 10,000 were given to spectators who were able to catch the cricket ball. Four lucky spectators also won brand new Jazz X handsets through a lucky draw. The entire selection procedure and the resulting tournament was part of Jazz Rising Stars – a one of its kind initiative aimed at finding hidden cricketing talent, provide them a platform to showcase their skills and equip them with the right resources to shine. The move was made in line with Jazz’s 'Dunya Ko Bataa Do' – a pledge undertaken to provide the right platforms and opportunities to Pakistani youth to achieve success. The Jazz Rising Stars T20 Cup has concluded but the journey of Jazz Rising Stars has just began. Jazz, in consultation with Lahore Qalandars, will be announcing the names of two players from the Jazz Rising Stars T20 Cup who will have the honor of representing Lahore Qalandars in Pakistan Super League 2017. Apart from this, 30 short-listed players, chosen from the tournament itself, will be awarded a once in a lifetime opportunity to travel all the way to Australia to engage with and learn from the current reigning Big Bash League Champions, the Sydney Thunders. Jazz is an umbrella brand of Mobilink (Pakistan Mobile Communications Limited) re-introduced as a complete telecommunications ecosystem. Jazz is all set to continue Mobilink’s leadership in the telecommunications arena by spearheading a digital revolution in the country through introduction of innovative services & products. The brand’s ultimate goal is to empower every citizen of Pakistan in today’s fast paced digital economy through its primary products i.e. Jazz Internet, Jazz Voice, JazzCash, and Jazz X.